I was extremely tired during the Ottawa Festival, so I've decided to only talk about films that I enjoyed even in my exhausted state. It's quite possible that a second viewing would lead me to different conclusions for films I didn't like, so rather than say things I'll later regret, I'll stick to what I liked. I've also reconciled myself to the fact that my taste and that of festival organizer Chris Robinson differ. It's pointless to criticize this year's selection as it was consistent with previous years and will no doubt be consistent with coming years so long as Robinson is making the selection. The Ottawa Festival is one of the most heavily scheduled events I know of; every time slot now has four events running concurrently. While that pretty much guarantees there will be something of interest every waking moment, it's also a guarantee that you miss things you'd like to see. For the record, I saw three of the five competition screenings, one of the two screenings of films for children, one of four UPA retrospective screenings, and two of the three features. I also attended two panels (one of which I spoke at) and a master class. I've already praised Perspeolis and Golden Age. In the competition, another favorite film was Lapsus by Juan Pablo Zaramella of Argentina. It's a graphically simple film, black and white with no half-tones, where a nun confronts a dark space. The film is highly inventive and funny, doing a lot with little. You can watch a brief clip of the film here. 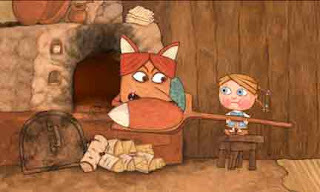 Zhiharka by Oleg Usinov of Russia is a fairy tale about a girl trying to avoid being eaten by a fox. The film had great humour and fantastic energy. I'm constantly amazed by the lack of timing in modern animation. This film was expertly timed and really carried the audience along as a result. If you can read Russian, you can find more about the film here. If there's a link to a clip, somebody please let me know. The UPA screening I attended was the one dedicated to directors. I think that Bobe Cannon is underrated as an animator and as a director. His animation in Robin Hoodlum very stylish and got me thinking about what we've lost in animation. There's no shortage of original design work visible at the Ottawa Festival, but I don't think that there's much in the way of original motion. Certainly, there's little where the quality of movement itself is entertaining in the way that Bobe Cannon routinely animated. I'm pretty sure that he did the fox and the knight here as well as the fox drinking his first cup of tea. Cannon's direction also used movement to entertain. I think that I already linked to Christopher Crumpet, but here it is again. Christopher's walk and his first transformation into a chicken are both fun in and of themselves. Bilgewater's stylized way of moving from pose to pose with no inbetweens is also fun to watch, as is the mother tripping and landing at the dinner table. These things don't take money to do, they just take imagination, but I don't see enough of it these days. Persepolis started as a graphic novel by Marjane Satrapi. It's autobiographical, relating her childhood in Iran during the period when the Shah was deposed and the government that replaced it was (and remains) an Islamic theocracy. This combination of a coming-of-age story set against political turmoil is what gives the story its power. Satrapi's family is politically liberal, so their position relative to the government was always precarious. Marjane confronted for wearing a Michael Jackson button. 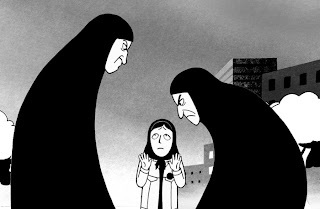 Persepolis is now an animated feature made in France, co-directed by Satrapi and Vincent Paronnaud. It's currently playing festivals (The Toronto International Film Festival and the Ottawa International Animation Festival, where I saw it and where it took the award for Best Animated Feature). It is due for release in North America in December in order to qualify for the Oscars. It has already been selected as France's Oscar entry for the category Best Foreign Language Film and of course it will be eligible for a nomination for Best Animated Feature. The film is a successful adaptation of Satrapi's book and I highly recommend that you see it. Besides being a satisfying experience in itself, it stands in stark opposition to most Hollywood animated features. It's drawn animation. It's black and white. It deals with politics and the real world. It not only has a female protagonist, but as Satrapi is the screenwriter and co-director, it has a genuinely female point of view. 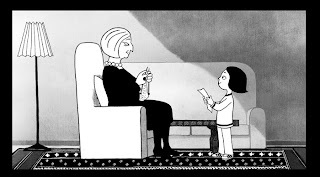 Marjane with her grandmother, one of the most vivid characters in the film. All of the above qualities are nothing special in live action. I'm sure that the audiences who view Persepolis at live action film festivals will that find it fits easily into the world of independent films and their subject matter. But in the world of animation, Persepolis blazes many new trails and it shows just how provincial animated features are. Yes, short animated films tackle many of the same themes, but the films are difficult to find and rarely reviewed. Whether we like it or not, features are the coin of the realm when it comes to film, and it's there that audiences and critics focus their attention. Animation tends to speak metaphorically. If it has a point to make, it places it within a fantasy context. This is one of the things that's kept animation at the children's table. Only a few animated film makers working in long format have grappled with the world as it is: Ralph Bakshi and Paul Fierlinger come to mind. What Satrapi has done with her first film is to show that animation is capable of more than Hollywood will allow. The film has shattered many tropes of conventional wisdom and proved in its festival screenings that it satisfies audiences. What she's done is to take subject matter that's commonplace in independent films and shown that animation can communicate it successfully. It's depressing that someone without a background in animation can use the medium more broadly than those who have laboured in the industry. Perspepolis will not be the highest grossing animated film released this year. It may not win any Oscars. But Persepolis is unquestionably the most important animated film of the year in terms of its subject matter and how the subject is treated. Perspeolis suggests a way forward that animation has mostly ignored. I'm not saying that all animated films should be like this one, but what good is a medium that voluntarily avoids dealing with large portions of human experience? That's Hollywood animation in a nutshell. I'm sure that Marjane Satrapi was focused on bringing her story to the screen as effectively as possible rather than challenging the animation industry. Be that as it may, she has entered the conversation. The question is, will anyone respond? There's an interesting discussion going on over at the Animation Guild blog about the use of Cintiq tablets in the various stages of animation production. With the Cintiq, you draw on the computer screen so it resembles paper in that your eyes focus on your drawing hand. It's a relatively new technology and the talk is about the potential for a paperless animation studio, though some artists have reservations about its use. Golden Age is a series of 10 short parodies of various aspects of animation history made by Augenblick Studios. The series was done for Comedy Central and ran at the Ottawa Festival. We're surrounded by parody in cartoons these days, but Golden Age is more sharply written and more quickly timed than most. The level of invention is high and there's not a bad one in the bunch. You can find the rest of them here. Enjoy. I'm back from Ottawa, but it's going to take a few days to pull myself together and collect my thoughts. In the meantime, here is the 1969 Pogo Special Birthday Special, written by Walt Kelly and directed by Chuck Jones. Kelly and Jones also provided several voices for this. I know from talking to Kelly's widow Selby that Kelly was disappointed in the results of the collaboration. It was because of this TV special that Kelly and Selby started their own animated short, We Have Met the Enemy and He Is Us. Here's a unique way to get your movie out to the public: sell distribution rights to a newspaper and have them insert DVDs of your film into the Sunday paper. You get paid for the local distribution rights, the paper sees a circulation bump because readers get a free movie with the cost of the newspaper, and your film gets seen by lots of people and generates word of mouth. I'll be arriving at the Ottawa International Animation Festival on Friday and staying through the weekend. On Saturday at 1, I'll be on a panel about animation blogging at the Arts Court - Club SAW with Michael Barrier, Jerry Beck and (I think) Ward Jenkins. If you follow any of the above bloggers, stop by and meet us in person. I had the pleasure of attending a screening of Joanna Quinn's work on Tuesday night, hosted by Quinn herself and Michael Fukushima of the NFB. I had only seen Quinn's first film, Girl's Night Out, and some of her commercial work for Charmin prior to this, and the screening showed me that she's much more than these films would suggest. Her other films demonstrated the high quality of Quinn's draftsmanship, her love of natural motion and her keen social awareness. Her films like The Wife of Bath show her continued interest in sexual politics and Brittania is a fantastic look at imperialism. This is Quinn's first visit to Canada. There will be a retrospective of her work at the Ottawa International Film Festival on Saturday at 1 in the National Arts Centre Southam Hall and a master class on Sunday morning at 9 a.m. at the NAC Fourth stage. She'll be appearing in Montreal after the festival (though I don't have the specifics for the Montreal appearance). Quinn herself is very personable, happy to admit to her mistakes while learning animation and to talk about her process and priorities as an artist. As her films are not yet on DVD, I urge you to take advantage of her Canadian appearances if you can. The trailer below represents Quinn to commercial clients. It gives a good idea of her design and animation approach but completely shortchanges the content of her work, which is far more intelligent than this trailer suggests. The whale chase begins. It's certainly one of the most exciting sequences in Disney films to that time and one that remains impressive today. The action is intense. Monstro is an enormous physical threat due to his size and power. The water is convincingly portrayed, making the threat of drowning real. We don't doubt for a second that Pinocchio and Geppetto are fighting for their lives. This sequence showcases the sophisticated understanding of water that the Disney effects animators had. If you compare the portrayal of water in this film with the water in Gulliver's Travels, released just a year earlier, the difference is striking. Gulliver opens with a storm at sea, but the water simply doesn't feel as liquid as the water in Pinocchio. In some Gulliver scenes, the foam on the waves seems to be sewed on, not sliding over the surface or changing its shape enough to be convincing. The water here works due to a combination of elements. There is the undulating surface, marked by independently moving masses which sometimes overlap. The undulation is helped by the colour-separated detail that flows over it and which constantly changes shape. There are also the foam and the splashes which break up and change shape over time. Colour, too, is critical, as the water has to reflect the environment it is in. Art Palmer, Josh Meador and Don Tobin did fantastic work on the water here. 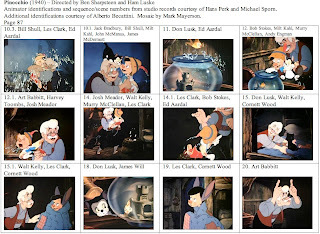 With the exception of Meador, few Disney effects animators have any sort of reputation. Sequences like this show that they deserve to. Start as young as you can, in any capacity. For directing music videos and commercials, the window opens around age 23. For features, the best you can hope for is to start in your late twenties. But the window closes too. If you haven’t directed a feature-length Hollywood picture by the time you’re 35, you probably never will. I was curious to see how animation directors stacked up. They generally skew older. One reason is that in the early years, animated features didn't exist and for decades they were relatively rare. However, even in the modern era, it's rare (as you'll see below) for directors to start in their 20s. Certainly there are directors in their 20s working in TV and in the old days on shorts. However if directing live action features is a young person's game, directing animated features is for the middle aged. 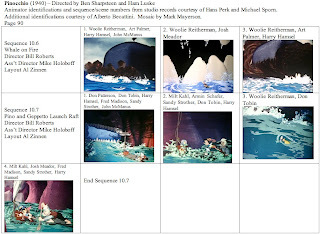 So here are some ages of directors for their first animated features. There are omissions here because the IMDB doesn't have birth dates for every animated feature director, which is why something as big as The Lion King is not listed. David Hand was 37 when he directed Snow White. 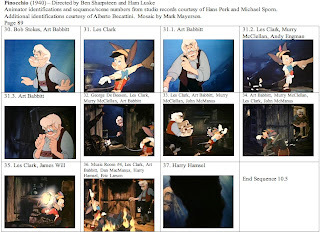 Ham Luske was 37 and Ben Sharpsteen was 45 when they directed Pinocchio. Dave Fleischer was 45 when he directed Gulliver's Travels. Jiri Trnka was 39 when he directed The Emperor's Nightingale. Jean Image was 43 when he directed Johnny the Giant Killer. John Halas was 43 and Joy Batchelor was 41 when they directed Animal Farm. Paul Grimault was 52 when he directed The Adventures of Mr. Wonderbird. Wolfgang Reitherman was 53 when he directed A Hundred and One Dalmatians. Bill Hanna was 54 and Joe Barbera was 53 when they directed Hey There, It's Yogi Bear. George Dunning was 48 when he directed Yellow Submarine. Bill Melendez was 53 when he directed A Boy Named Charlie Brown. Ralph Bakshi was 34 when he directed Fritz the Cat. Richard Williams was 44 when he directed Raggedy Ann and Andy. Bruno Bozzetto was 44 when he directed Allegro Non Tropo. Don Bluth was 45 when he directed The Secret of NIMH. Will Vinton was 38 when he directed The Adventures of Mark Twain. John Musker and Ron Clements were both 33 when they directed The Great Mouse Detective. Gary Trousdale was 31 and Kirk Wise was 28 when they directed Beauty and the Beast. Henry Selick was 41 when he directed The Nightmare Before Christmas. John Lassetter was 38 when he directed Toy Story. Brad Bird was 42 when he directed The Iron Giant. Peter Lord was 47 and Nick Park was 42 when they directed Chicken Run. Chris Wedge was 45 when he directed Ice Age. Sylvain Chomet was 40 when he directed The Triplets of Belleville. Richard Linklater was 41 when he directed Waking Life. I wonder, given that the majority of the movie audience is under 30, if this is one of the reasons that animated features have a problem capturing the teen market. The age of animation directors is very appropriate, though, for family films, as most of the directors above likely had children of their own at the time they got their first feature assignment. I was talking to a friend about the state of the industry and I realized that the gap between TV and features is growing wider on several fronts. Not too long ago, both features and TV were done using the same technology: drawings on paper. Features have moved heavily in the direction of cgi and TV has moved heavily in the direction of Flash or Toonboom. The reasons for this are economic. Both features and TV have their problems in terms of content, but the one thing that's undeniable about features is that they operate at a higher level of craft. There is time to revise and to polish. In TV, a minority of shots get revised. This has repercussions for the animation workforce. In the past, while features were always seen as the top of the industry, there was a certain amount of mobility between TV and features. Today, I'm guessing that there's a lot less. Besides the fact that the software is entirely different, those working in TV have less opportunity than they did in the past to do work that aspires to feature quality (even if TV budgets and schedules guarantee that the work will fall short). While I believe that any working artist should be as versatile as possible in order to stay employed, I wonder if for the time being we've reached a point where anyone aspiring to work in features has got to stay completely focused on that goal. In the past, opportunities would arise (especially in studios doing their first features) for people to move in from TV. I'm not so sure those opportunities will be as plentiful in the immediate future. Long term, though, all bets are off as the field keeps evolving in ways that nobody can predict. I've started a blog that's a repository of links to Sheridan College animation students. If you're a Sheridan student and want to be included, please email mark(dot)mayerson(at)sheridanc(dot)on(dot)ca with your name, year and link to your page. I'll continue to update it in the weeks to come. Pinocchio and Geppetto are finally reunited. This sequence is rich in emotion and once again Pinocchio takes postive, independent action to save his father. The sequence works despite the fragmented animation assignments. 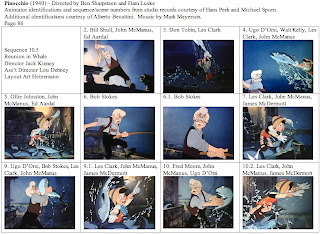 Geppetto, in particular, is played by many animators in the early section. For Pinocchio, this is a great sequence for Les Clark, but he loses some of the shots to other animators, including some important ones (10.1, 12 and 24.3) to Milt Kahl. Sentiment is always dangerous, which is why comedy is often used to soften it. Here, when Pinocchio calls out to his father, Geppetto brushes him off as he's focused on bringing in the tuna. When he finally realizes that his son is there and reaches to embrace him, he grabs a tuna by accident and kisses it, getting another laugh. No doubt Disney learned this kind of thing from Chaplin. 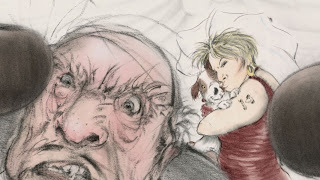 City Lights features a sequence where the tramp falls in love with the blind flower girl and as he stares longingly at her, she unknowingly tosses water in his face. Physical contact between characters is very powerful, especially when the characters are flexible enough to squash in the manner of real flesh. There are several hugs between Geppetto and Pinocchio here. 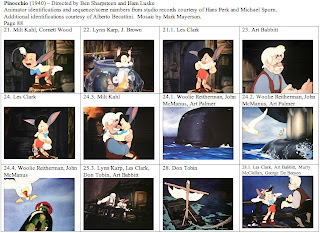 It's interesting that only one of them (24.3) is by a single animator, in this case Milt Kahl. In the previous hugs, Bill Shull and Les Clark enact one (10.3) and Art Babbitt and Harvey Toombs enact the other (12.1). All, however, are emotionally satisfying. Les Clark's posing of Pinocchio in 21.1 and 24 is just fantastic. I made negative comments about Clark's drawing of Pinocchio back in Part 6. While there were some rough edges on Clark's drawing in those early scenes, these two scenes are ones that any animator would be proud of. The sweep of the legs and spine captures Pinocchio's hesitation, embarrassment and shame simultaneously. Clark isn't known for a particular performance the way some of the other animators are, but this sequence is definitely one that should be mentioned whenever Clark is discussed. We get a brief glimpse of Jiminy, re-establishing that he's outside Monstro, before going back inside while Pinocchio plans the escape. Here, the whole show is pretty much Clark and Art Babbitt, and there's solid acting for each of the characters. Babbitt's phrasing of Geppetto's body during dialogue is excellent. The two characters are thinking along very different paths and yet Geppetto stays in the conversation with Pinocchio while not understanding his intentions. That's good writing and Babbitt makes it work, keeping Geppetto calmly focused on cooking the fish until he realizes Pinocchio's intent and what it will lead to: one very angry whale. 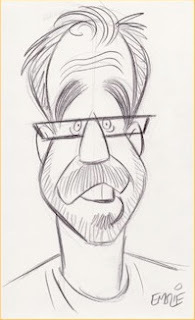 Steve Schnier, caricatured at left by Peter Emslie, has a long history in the animation industry, including creating the series Freaky Stories. Steve is somebody willing to go out on a limb. Where other people dream, Steve hustles. Steve's latest project is a feature film made from home movies that he bought on Ebay called Pubic Lice: The Motion Picture. The budget? $4,000. You can read all about it and see some clips here. Steve is not only attending the Toronto International Film Festival searching for a distributor, he's also writing a daily column for Canada's National Post newspaper all week, detailing his experiences. I believe that this is the first article. To be honest, I'll probably hate this movie. It's just not what I look for in a film. But having said that, I think that Steve was absolutely right to take a chance on this and push it as far as he can. Steve doesn't give his ideas away. He markets them. He's not afraid to get meetings or to pitch at the slightest opportunity. The future is always going to belong to corporations, but we're living in a time where there are ways to publicize your ideas that didn't exist in the past and because of that, the future is also going to belong to people like Steve. If you've got ideas, great! Now think of ways to market them. 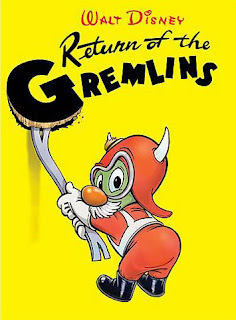 Here's an interview with Dean Yeagle, including a discussion of his work reviving the Disney version of Roald Dahl's Gremlins. We're back outside Monstro and once again, Woolie Reitherman handles all the main characters in this sequence, a real rarity in this film. The sense of scale is again reinforced by the size of the tuna relative to Monstro. Shot 8 has some lovely perspective animation of Monstro coming towards the camera. Once Monstro breaks the surface of the water, there are gulls to emphasize Monstro's great size. Finally, we see Jiminy floating past Monstro's giant eye and then his substantial teeth. Monstro's eye does not get treated consistently. In sequence 10-2 in shots 2 and 5, Monstro's eye goes from cartoony to more realistic. In this sequence in shot 14, the eye is a painted background with airbrush highlights, the most realistic rendition of it yet. Reitherman's Pinocchio still has a longer than average nose. Pinocchio climbing over the tuna to gain ground on Monstro is a repeat of the gag with Jiminy climbing on Pinocchio in sequence 10.4. Shot 9, with Monstro breaking the surface of the water and slamming his jaws shut is a powerful. The frame after the one in the mosaic has Monstro's mouth totally closed, very wide spacing between the drawings for a character who takes up so much of the screen. Monstro has all sorts of rendering on him to give him more surface detail to enhance his reality. 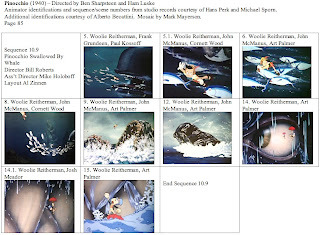 The animation of the water appears to be a moving painting, possibly painted on top of the cels instead of the underside. These early Monstro scenes are all about size and power. It's necessary to see Monstro in action before Pinocchio and company make their escape. The audience needs to know the magnitude of Monstro's threat so that the suspense of the escape will carry the maximum emotional impact. 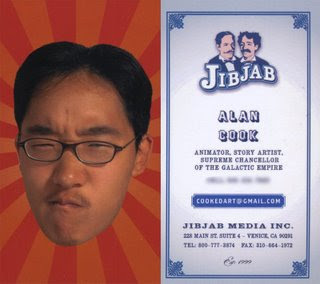 Sheridan student Alan Cook spent the summer interning at JibJab in Los Angeles. He's written an excellent blog entry on what it was like to work for the company and the how the company's philosophy is shaping its development and products.